1. Monophyletic Groups: The groups showing similarities due to single ancestors are called monophyletic groups. The classification based on monophyletic groups is called monophyletic classification. This classification show evolutionary relationship. The species should have single ancestral species. All the descendants should arise from this single ancestral species. The taxonomists look for characters for searching out monophyletic groups. These characters indicate relatedness. A character is anything that has a genetic basis and can be measured from an anatomical feature to a sequence of nitrogenous bases in DNA or RNA. 2. 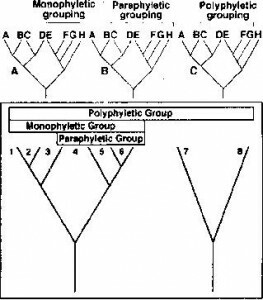 Polyphyletic Groups: The groups showing similarities but have separate ancestors are called polyphyletic groups. Each group has a single ancestor. A poly hyletic group indicates insufficient knowledge of the group. A polyphyletic group indicates insufficient knowledge of the group. 3. 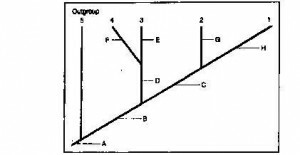 Paraphyletic group: A group formed temporarily for some lineage is called paraphyletic group. Paraphyletic groups are formed due to insufficient knowledge of the group. These groups are formed temporarily. It includes some members of a lineage. Fig: Assemblage of specie 1-8 is a polyphyletic group. 1-6 specie have different ancestor than specie 7 and S. Assemblage of specie 3-6 is a paraphyletic because I and 2 share the same ancestor as the 3-6. But they have been left out of the group. Assemblage of specie 1-6 is a monophyletic group. (i) The methods of investigation. (ii) Use of data in describing distant evolutionary relationships. 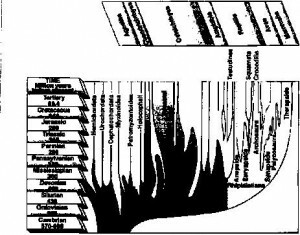 The systematic in which evolutionary relationships are developed by study of fossils of ancestors of closely related animals is called evolutionary systematics: Its basic assumption is that organisms closely are related to an ancestor. These organisms resemble that ancestor more closely than they resemble distantly related organism. Evolutionary systematics is the oldest of the three approaches. It is sometimes called the traditional approach. But it has changed since the start. According to this there are two types of similarities between the organisms. These are homologies and analogies. (a) Homologies: The resemblances that result from common ancestry are called h0mology. It is useful in classifying animals. An example is the similarity in the a augment of bones in the wing of a bird and the arm of a human. (b) Analogies: The resemblances that result from organisms adapting under similar evolutionary pressures are called analogies. It is also called convergent evolution. Analogies do not reflect common ancestry. So these are not used in animal taxonomy. T e similarity between the wings of birds and insects is an analogy. Evolutionary systematics can be shown on phylogenetic trees. 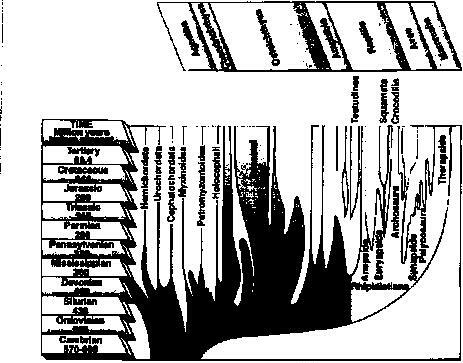 The organisms are grouped according to their evolutionary relationships in phylogenetic tress. These diagrams show the rate of evolution. They also show the relative importance of certain key characters. (a) Numerical taxonomists do not distinguish between homologies and analogies. Numerical taxonomists admit that analogies exist. But they believe that telling one from the other is sometimes impossible. Therefore, the numerous homologies used in data analysis dominate the analogies. (b) The numerical taxonomists limit discussion of evolutionary relationships to closely related . It is a major difference between evolutionary systematics and numerical taxonomy. Numerical taxonomy is the least popular of the three taxonomic schools. However all taxonomists use the computer programs that numerical taxonomists de eloped. organisms. But cladistics are more open to analysis and testing. Therefore. it is more scientific than evolutionary systematists. (a) Symplesiomorphies (basic characters): The characters that all members of a group share are called symplesiomorphies. These characters are homologies. They indicate a shared ancestry. But these characteristics are useless in describing relationships within the group. The cladists look for a related group of organisms called an out- group. They decide from the out-group what character is ancestral for a group of organisms. (b) Synapomorphies (derived characters): Characters that have arisen since common ancestry with the out-group are called derived characters or Synapomorphies. 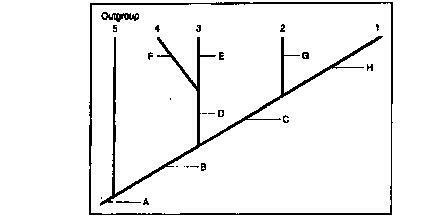 Cladogram: The hypothetical (P) lineage shown in a diagram is called a cladogram. Cladograms give sequence in the origin of derived characters. A cladogram is a family tree. It follows a hypothesis of monophyletic lineages. New data is formed in the form of newly investigated characters. Or it gives reinterpretations of old data.The new data is used to test the hypothesis the cladogram. Fig: Interpreting Cladograms: This hypothetical cladogram Shows Five taxa (1-5) and the characters (A-H) used in deriving the taxonomic relationships. Character A is symplesiomorphy for the entire group. Taxon 5 is the outgroup. It only that shares that with taxonomic character with taxa 1-4. All other characters are more recently derived. What single character is a synapomorphy for taxa I and 2. separating them all other taxa. 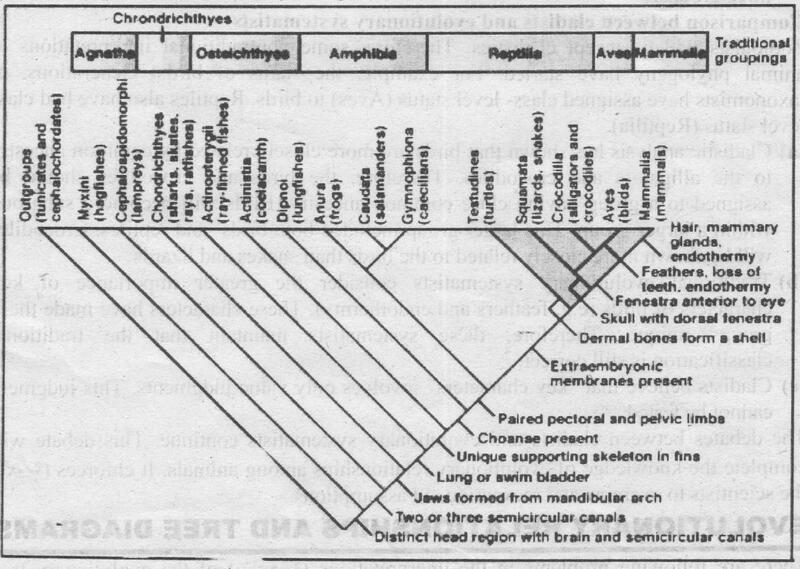 This is cladogram shows the evolutionary relationship among the vertebrates. The tunicates and cephalochordates are out-group for the entire vertebrate lineage. 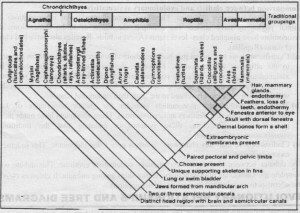 Derived characters are listed on the right side of the cladogram. 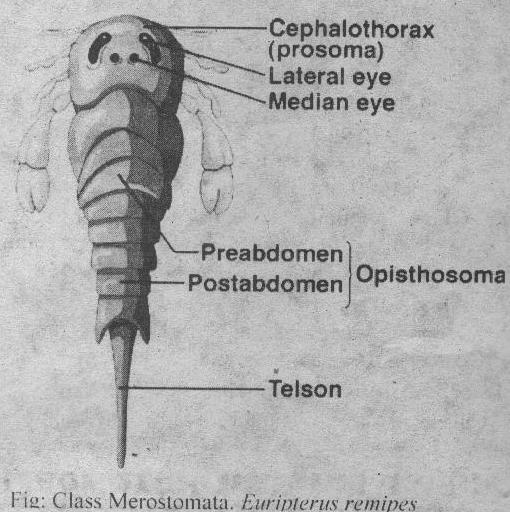 (a) The character of extra embryonic membranes is a Synapomorphy. It is used to define the clade. This chide contains reptiles, birds and mammals. These extra embroynic membranes are a shared character-for these groups. These characters are not present in an of the fish taxa or the amphibians. (b) The reptiles. birds. and mammals can also be distinguished. For this purpose a derived character is required. These characters must be more recently derived than extra embryonic membranes. For example. the shell is a derived character. It distinguishes turtles from all other members of the chide. The characters of skull distinguish between the crocodile lizard and bird lineage from the mammal lineage.The hair. mammary glands, and endothermy are unique mammalian characters. (c) The synapomorphy at one level of taxonomy may be a symplesiomorphy at a different level of taxonomy. Extra embryonic membranes are a synapomorphie character within the vertebrates. It distinguishes the reptile/bird/mammal elude. It is ancestral character lin the clade. Therelbre. it is symplesiomorphic tor reptiles. birds, and mammals. That is why it cannot be used to distinguish among members of these three groups. (a) Cladistic analysis has shown that birds are more closely related by common ancestry to the alligators and crocodiles. Therefore. the birds and crocodiles should he assigned to a group having close common ancestry. Birds will become a subgroup within a larger group. this larger group included both birds’ and reptiles. Crocodiles will be shown more closely related to the birds than snakes and lizards. (b) Traditional evolutionary systematists consider the greater importance of key characters of birds (e.g. feathers and endothermy ). These characters have made these groups unique. Therefore, these systematists maintain that the traditional classification is still correct. (e) Cladists believe that “key characters“ involves only value judgments. This judgment cannot be tested. The debates between cladists and evolutionars systematists continue. This debate will complete the knowledge of evolutionary relationships among animals. It enforces the scientists to examine and reexamine old assumptions.